Pink Image is a full-service breast health clinic that offers thermograms, clinical examinations, interpretation, consultations, and treatment. Pink Image Breast Thermography is firmly rooted in the origins of breast thermography history. 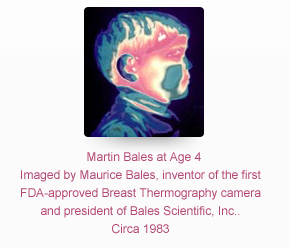 Maurice Bales, President of Bales Scientific, invented the first digital infrared camera in 1979, and until 2010 was the only camera FDA approved for breast thermography. Breast thermography research studies have shown that an abnormal breast thermogram is a definitive marker for potential risk of developing breast cancer, even more significant than family history. Currently, many other cameras used for breast thermography are FDA approved for skin temperature variation ONLY. These cameras scan a very low number of optical lines, resulting in poor image quality and less detail of the breasts. All breast thermography research was performed on high optical line cameras and because of this; low optical line cameras cannot apply the results of this research to their imaging methods. Therefore, it is imperative to obtain breast thermography from practices that utilize high optical line cameras since these images are rich in the details required by the proper interpretation of breast thermography. The Bales TIP (Thermal Image Processor) camera provides 600 optical lines of resolution, allowing for the most detailed infrared (heat) images of the breast. When imaging breast tissue for potential malignancies, it is important to utilize a high resolution, ultra sensitive infrared camera such as the Bales TIP camera. The Bales Tip FDA approved breast thermography camera has dominated the market for 4 decades. Superior technology is a key factor in certified breast thermography. Pink Image Breast Thermography utilizes technology that increases early detection, promotes prevention, and ultimately saves lives. Pink Image Breast Thermography is a simple, non-invasive, no-contact, no radiation, and pain-free screening procedure for women of all ages. Pink Image Breast Thermography is safe for pregnant women, nursing mothers, women with implants, fibroids and dense breasts. This is the only breast screening recommended for all women ages 25-39 when breast cancer can be particularly aggressive. Pink Image Breast Thermography is a superficial screening procedure which is able to monitor small changes or abnormalities by analyzing vascularity or blood flow in the breasts. Thermography's sensitivity makes it ideal for breast cancer screening and breast health treatment as it can detect minute changes in the breast tissue which can be monitored over time. When the breast is cooled in a temperature controlled room, blood vessels of normal tissue may respond by constricting to conserve heat while tumor tissue and its blood vessels may remain hot. The vascular patterns frequently associated with tumors may emit more heat than their surrounding tissues, thus allowing them to be detected by Pink Image's heat sensing infrared camera. Breast thermograms show highly specific thermal patterns in each individual woman. They provide a unique "thermal signature" that remains constant over years unless there is a change in an underlying condition. Thus, over time, it is possible to differentiate between cancers and benign conditions. Since the technology has the ability to accurately detect cancers over time, it becomes important to have a baseline early on in a woman's life. For this reason, women should have breast thermography performed as early as age 25. Since Pink Image Breast Thermography can also screen for environmental estrogens, estrogen hormone therapies (bio-identical estrogen, flax and soy), as well as the body's naturally occurring estrogen, it is a valuable tool for monitoring hormone levels and breast health treatments. Please note hormone monitoring is just for breast health assessment and is not FDA approved for breast thermography. Since thermomgraphy is a superficial screening process that analyzes the blood flow of the skin, thermograms are unable to "see inflammation" of the digestive tract, uterus, and organs directly. Pink Image Breast Thermography is revolutionizing the fight against breast cancer by providing the technology and experience to maintain long term breast health. Our premier services are unrivaled in the United States. There are only two recognized national thermography boards and Pink image is the only breast thermography clinic in Southern California that is certified by both boards. Pink Image Breast Thermography is also one of the few clinics whose reports follow the strict guidelines established by the national boards. Pink Image Breast Thermography does not replace mammography. In fact, the two screening modalities are a great complement to each other. Since it has been determined that 1 in 8 women will get breast cancer; every possible means should be used to stop the epidemic. This is best accomplished with early detection through screening. Pink Image Breast Thermography provides the technology to revolutionize the fight against breast cancer. Pink Image's camera is FDA approved for Breast Thermography. Notice rich details in images from the Bales TIP 600 optical line camera. These images are from other Breast Thermography Clinics. This clinic's camera is not FDA approved for Breast Thermography. It is only FDA approved for skin temperature variations. Note lack of detail. Many other clinics do not provide gray scale images as Pink Image does. When interpreting these scans, the gray scale images provide the most information, as opposed to color images. You may also view these comments on Yelp. "Pink Image has changed the way I take care of myself. I went there for a simple thermogram over a year ago, but ended up getting life changing advice that I decided to take to minimize my chances of becoming a breast cancer statistic like my mom and grandmother. Wendy was insistent that my hormonal IUD was contributing to high estrogen levels showing up in my left breast and said the only way I can get that to change is to replace the IUD with the non hormonal one. I was very resistant as I sure liked not having any periods on the Mirena. But after my 2nd thermogram in 8 months showing no changes even after I made drastic diet and changes in the body products I was using (switched to non paraben and more natural), I decided it was time to get the hormones out of my body. I wish I would have done it much sooner as I didn't know I would start dropping that extra weight off without hardly any extra effort! I've dropped 5 pounds very easily in 3 months where it used to be a battle to lose half a pound and then it would come back as soon as I ate a large dinner. I still have to have to get a follow up thermogram in the next few months, but the pain I used to get in my left breast has almost left me thankfully. Wendy's simple advice on changing the types of foods I eat and the type of products I put on my body every day has been the first step in being proactive in my continued well being. It doesn't have to be hard. I just have to make the extra effort to research the products I am buying, and making the conscious effort to eat the better foods, including organic. She truly has been wonderful to work with. I highly recommend Pink Image and Wendy Sellens!" "I cannot say enough great things about Pink Image, especially Wendy Sellens. Almost a year ago, I had pain off and on in my left breast that sometimes would throb so much it would wake me up in the middle of the night. I did research and was intrigued by thermography as a non-invasive way to detect abnormalites. There were many options for thermagraphy, but chose Pink Image because of their advisor and qualified staff. I was unsure what to expect, but Wendy instantly put me at ease walking me through the process the entire way. Wendy immediately saw an unusual hypervascular pattern in the area I was experiencing pain (I could see it as well on the screen). I subsequently had an ultrasound in which everything checked out fine, but at Wendy's suggestions, I made some lifestyle changes. Wendy informed me I was estrogen dominant/progesterone deficient and needed to make changes to the products I was using and food I was eating. Things I thought were good for me, such as flax and soy, were actually perpetuating my imbalance. Wendy armed me with a lot of data and provided me with links to other sites to do research. I have to admit I was overwhelmed at first, but it was so nice to hear Wendy tell me change did not need to occur overnight. I'm probably 70/30 (70% good ... 30% not so good!) now in the lifestyle changes we have incorporated based on Wendy's suggestions and I have to say, I feel sooooo much better! I have not had the pain in my left breast since making the changes and I know it is directly correlated to the products and food choices made. Thanks Wendy and Pink Image!!" "Pink Image is truly the gold standard of breast thermography. I was sent to Pink Image when my health care practitioner saw something slightly suspicious on one or both of my breasts. After my results were mailed to me, I called Wendy Sellens and she explained my scores. I felt for the first time that I understood the basics of breast health. There is a TON of misinformation out there and it was so refreshing to get some clear information about how to care for "my girls". I now know what to do and what to stop doing. This test is safe for pregnant women, women who are nursing and women with implants. This is the only test available for women from 25 to 39. The most reassuring fact is that thermography can detect cancer 6 - 10 years before a mass (or lump) can be felt. Do yourself a huge favor and go to their website, watch the informative videos and read the articles. You will be amazed at what a great resource it is." "I knew something wasn't right a few years back and I was urged to get a thermogram. Unfortunately, I hadn't done my research and settled on a clinic that was not FDA approved. I was misinformed and for quite some time had false confidence. Almost 6 months ago, at age 36 I was diagnosed with stage 2 breast cancer. This is when I realized I needed to do my homework, my own research, and be my own advocate. I was on a mission to decode my own pathology report. Not an easy task I might add. I've learned cancer is a mystery. Who's research and recommendations do you believe? After a lot of research, I decided to have an FDA-approved thermogram at Pink Image in Solana Beach, CA. There, I met board certified thermologist, Wendy Sellens, L.Ac. She informed me that I had options. She quickly sent my screening results and pathology report to her advisor, creator and founder of the certified breast thermology model, William Hobbins M.D. Dr. Hobbins had me contact him right away and gave me a short lesson on the very specific type of breast cancer I had and shared an alternative path that I should consider. He gave me words of truth, hope, and courage. Dr. Hobbins asked if he could pray with me and instantly, I realized the power of my faith would have to play the primary role in my recovery. It is vital that when getting a thermogram, it is an FDA-approved thermography camera. I want to thank Wendy Sellens at Pink Image, for her professionalism, compassion and true discernment. She was a critical member of a team that literally helped save my life." "After someone very close to me passed away from breast cancer at the young age of 42, I was determined to find a better alternative to annual mammograms. I did a lot of research and reading and found a recommendation for Pink Image and breast thermography. It made perfect sense to me, was completely safe, unlike mammograms, and could detect cancer up to 7 years earlier. When I met Wendy Sellens at Pink Image, it was clear that Wendy had a huge amount of knowledge, a passion for what she was doing and a true caring for helping others to avoid breast cancer. She has shared, and continues to share, so much knowledge as she herself is always striving to bring the best information to the forefront. I can't imagine why anyone would not take advantage of an opportunity to have a thermogram. They give you the information you need to avoid a situation that no one wants to be diagnosed with at a time when you can likely have a positive effect. Just as a side note, all centers performing thermograms are not the same. I have been to a few that use a very old method that is no where near as accurate." "Ladies, this is a long story that began in 2000. It is a first hand account of my journey down the breast cancer road. Mammograms were routine with me up to that time. When I experienced an oozing from my right breast, I immediately went to the doctor. Upon examination, the doctor found no lumps and scheduled me for monthly visits that went on for one year. At the end of that time he scheduled me for a biopsy, which revealed an advanced and aggressive cancer. Mastectomy followed after which the radiologist took an ultrasound that showed the left breast was clear. About four months later I felt shooting pains in my left breast. By this time I had a new doctor because my insurance had changed. He immediately tested me. The diagnosis - aggressive cancer. A second mastectomy followed, then chemotherapy. The oncologist who followed me for 5 years declared in October 2006 that I was "cancer free". In December 2006 I found lump on the chest wall. The oncologist was on vacation, (lucky for me I figured later on). My surgeon saw me, did a biopsy immediately, cancer had metastasized. This was followed by PET scan, bone scan, CT scan and other tests. I was turned over to the oncologist, who very glibly told me I had a year to live, but with chemotherapy, 2 years. A man who had never tested me properly, who said I was cancer free in October and now in January a death sentence! You guessed it, I walked right out and I am positive that God guided me down the road to alternative care. Like so many women who trust in our country's answer to cancer...barbaric cut, burn and poison treatments, I wised up and educated my self. It is 8 years and I am still here. Only God knows our death date, not man and specifically not an oncologist. All this to say that had I heard of thermograophy I would not have suffered so, (and continue to do), because of barbaric practices that scar your body and soul. In 2007 I was blessed to find information on thermography. Research led me and a friend of mine to Pink Image. We both had thermography in Murrieta California with Martin Bales of Pink Image, when our results were in, my friend herself a cancer survivor, had a "hot spot" on her right breast which was cancer. Prior to this she had a left mastectomy with no evidence of a problem with the right breast even after months of follow ups. Early detection through thermography will save your body from invasive procedures-the standard cut, burn and poison. Please consider this "alternative treatment" and remember cancer does not need to be feared...just to be fought and it can be! I did it and so can you." "Wendy at Pink Image Breast Thermography and her Breast Cancer Boot Camp are a wonderful resource for me. I have a strong family history of breast cancer. Doctors have recommended for years for me to remove my healthy breasts. Undergoing surgery, while I am healthy, does not sit right with me and I am focused on prevention. Wendy encourages regular MRIs along with thermography. I feel very supported by having complimentary options. I love thermography because I can actually see what is going on in my breasts. I have been having thermography with Wendy for the past couple of years. I am so grateful for Wendy's recommendations for breast health based on her research. I avoid flax and soy, apply progesterone cream, watch what products I buy, and go to acupuncture regularly. With thermography, Wendy is able to show me the positive changes in my breasts since I have shifted my life style. I am very grateful to have this valuable information and education." "Pink Image is the best! I have family history of breast cancer so it has always been a concern of mine. A friend of mine has been in to see Wendy and suggested that I go to find out the health of my breasts and what I can do to prevent the possibility of breast cancer. I made my appointment with Wendy and I can't say enough great things about her and how informative she was. I am amazed at the amount of products that contain estrogen and are very unsafe. Every woman should have breast thermography." "Wendy at Pink Image Breast Thermography is excellent. She educated me and my husband Dave. I was so impressed with her knowledge, passion and expertise. I took advantage while visiting San Diego for vacation to have a session with Wendy. Both my husband Dave and I received the imaging. I felt comfortable during the procedure and knew that I was in good hands. I was educated on the imaging and given great advice and I plan to get checked in another 6 months. Breast Cancer Boot Camp is another amazing resource. I believe that everyone should use thermography as a preventative tool." "After my OBGYN refused to provide me with an Ultrasound and insisted on yet another mammogram (which always comes back inconclusive due to my dense breast tissue), I went to get a thermogram at Pink Image. Wendy provided me with a full write up on what was happening and then debriefed over the phone with life changing recommendations on what to do to rebalance my hormones and lower the estrogen levels in my body. I cannot be more grateful to Wendy and the whole process and cannot recommend her enough! Please go see her - it may save your life." "DO YOUR RESEARCH! Pink Image is the gold standard in thermography and it is worth traveling to. I am 63 and I have been getting mammograms yearly since I turned 40. With the all the controversy I've been nervous about having anymore due to the high amount I have done over my life time. I had heard about thermography and started doing research which led me to Women's Academy of Breast Thermography. I called to see if there were any approved clinics in Washington. Wendy was incredibly helpful and addressed my concerns. I had not had a mammogram for 4 years, which concerned her. Wendy explained that thermography is not regulated and many clinics are making false claims and not doing it correctly, which I knew right away after seeing her website versus others. She informed me since I had not had a diagnostic test in 4 years that I needed one and should get an ultrasound, mammogram or MRI since thermography is only screening and does not replace a mammogram. I was surprised that Wendy wouldn't just take my money and business, but actually referred me out to the appropriate test I needed! I appreciate she took the time to explain thermography screening versus diagnostic imaging. 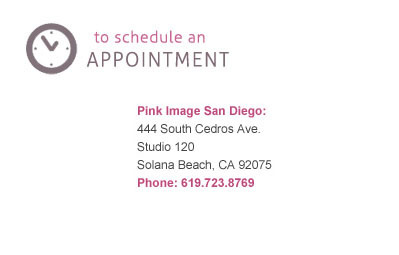 I decided it was worth going to Pink Image to get the best thermogram so a year and half later I decided to visit San Diego for vacation I made an appointment with Pink Image. Wendy said I was within normal limits, but explained I had an unusual pattern in my breasts which was undetectable with my ultrasound and mammogram (my doctor made me get a mammogram also) she had suggested the year before. I told her my doctor had put me on black cohosh and Estrovera for my menopause. I could see my blood vessels and what she was explaining to me in my breast thermogram . I quit taking the plant hormones followed her suggestions and my hot flashes and breast pain stopped, I'm sleeping better than ever and I lost weight!! I couldn't believe the estrogen supplements the doctor suggested were making me worse. Buy her book, the pictures in it say it all! My integrative doctor wants to put me on bio-identical estrogen now, but after reading Breast Cancer Boot Camp I know natural estrogen will increase my risk, besides I feel great now thanks to Wendy. Wendy is a leader in thermography, a wealth of information and a very compassionate doctor who is passionate about women's health. Every woman should read this book and try to get to Pink Image for thermography, you will be happy you did." "I do not live near Pink Image Breast Thermography, but I wish I did. I live in a different state. I have been using a local Thermography service to monitor my breast over the last 4 years. I have very dense breast tissue and in the past every time I would get a mammogram I would end up getting an ultrasound and had lots of scares. I was thrilled to find an alternative in Thermography. I picked up Wendy Sellens book last year "Breast Cancer Boot Camp". After reading it I started to question the Thermography reports I was issued. I consulted with Wendy and she reviewed the interpretations I received from the service I used. Wendy pointed out to me so many disturbing deficiencies in the interpretation of my exam. I see now that having Thermography services regulated would be a tremendous benefit to women. Thermography is a gift and an awesome tool, but put in the wrong, untrained hands it can be a detriment. I see firsthand the battle that Wendy faces as she tries to educate women and doctors. I know these practitioners mean well, but proper education and the right camera/tools/interpretation are key to making this a viable option for women moving forward. If you are using a Thermography service other than Pink Image Breast Thermography, please refer them to Wendy's website/blog and her book. Wendy has started this Revolution. Let's rally around her." By William B. Hobbins M.D., Wendy Sellens L.Ac. You may also view these comments on Amazon.com. "This book should be in every woman's library. By reading this book you will understand the benefits of Thermography and become better educated as to how estrogen dominance contributes to breast cancer. You will view pictures of years of research that helps explain it all. Especially how flax and soy are contributing to estrogen dominance. I was not aware of the danger of estrogen dominance. I am thankful I found this book and refer to it often. I feel better equipped to maintain breast health." A must read for every woman and thermographer! "This is hands-down the BEST book I've read on breast thermography. Every woman and every thermographer needs a copy! Themography is such a great adjunctive tool to evaluate overall breast health risk, but it needs to be done properly within certified clinics by certified technicians, taking the images in both gray scale and colored images with a high quality, cleared camera and then read by experienced, certified interpreting doctors. This book is beautifully illustrated with before/after images which clearly shows some of the physiological responses in the breast caused by various forms of estrogen especially from phytoestrogens, xenoestrogens, birth control,HRT, certain herbs and supplements. As a thermographer and nutritionist, I have personally seen the effects of these excess hormones on the breast and the health that can be regained by eliminating them. Wendy Sellens images of before/after flax seed use were of particular interest to me. Flax seed is extremely high in phytoestrogens, even higher than soy! At one point I had added 2 TBL of flax into my diet and within 4 weeks I experienced extremely tender breasts, hot flashes, and even skipped a period. After removing flax, within a few weeks the symptoms subsided. Hormones do affect our breasts! Having breast cancer in my family history, this book brings incredible hope. One study on PubMed tells us that only 5-10% of cancer has a genetic link. The remaining 90-95% has its roots in environmental and dietary habits. This tells me that although we may not have 100% control, there is much we can do to prevent chronic diseases such as breast cancer. By utilizing all the tools available, including thermography, we can screen the breasts for changes. Then by changing lifestyle and nutritional habits, we can have a positive affect on our health. I emailed Wendy Sellens to personally thank her for writing this book with Dr William Hobbins. Within a day she responded and we set up a phone consultation. Her passion for women's health is amazing and her pursuit for thermographic excellence is extremely important. Breast Cancer Boot Camp is a must read. Wendy is definitely a soldier for breast health!" Excellent breast health guide every woman should read! "This book is an excellent! It provided the most entertaining, easy to read delivery of medical information that I have ever read. EVERY WOMAN SHOULD READ THIS BOOK! I was blown away by all the simple, east to implement and important information." "I'm still reading the book. Insightful. Excellent resource to help understand thermography and cancer prevention to an extent." Life saving information! An excellent, informative read. "An excellent read. Very informative on the subject of using Thermography as a screening procedure to evaluate breast health risk. Very well illustrated and complete with references. I was personally shocked to learn that 80% of breast cancers may be preventable as they are driven through an overabundance of estrogen. What is further disturbing is that many so-called "herbal" and "natural" remedies, which claim to alleviate estrogen-dominant cases do not in fact do so at all, in fact they may even make the situation worse. This is objectively seen through the many before/after thermographic images. This book also clearly demonstrates the need to be imaged at a certified location. For those unfamiliar, William Hobbins MD is the creator of the certified breast thermography model. He imaged 176,000 women to develop this model which utilizes greyscale imaging to determine vascular patterns in the breast. It is through these vascular patterns that a certified interpreter can determine risk and recommend dietary/lifestyle changes to help avoid breast cancer all together. Unfortunately all thermography is not created equal. Many uncertified health practitioners (some with no medical license!) have wandered from the basic requirements, such as analyzing vascular pattern via greyscale images. They instead use color images which look pretty but don't contain information vital to establishing personal risk." "I am only in my late 30's and already have had several friends my age diagnosed with Breast Cancer, one who passed away at the age of 37. Why are the rates going up? Why are women getting cancer at an earlier age? What can we do to decrease risk and prevent Breast Cancer? The answers are in this book. This is an amazing resource for all women. We can make lifestyle choices to decrease our risk! I have used the information in this book, as well as thermographic imaging, to take action to decrease my risk factors. I am a health care provider, and use this book as a resource in my private practice to educate my patients, and in my faculty teaching position as well." "Prevention is the "cure"! This book clearly shows (using advanced medical thermal imaging) how the effects of many commonly used products, along with exposure to a multitude of chemicals are increasing our risk for breast cancer. I love this book and highly recommend it to any woman who wants to be proactive and help to prevent breast cancer instead of our current model of mammography "screening" starting at age 40. By the time you see something on a mammogram you are already sick, meaning the tumor is already formed. Using thermography as the first screening tool (recommended to start in our 20's), gives women the power to take control of their breast health. Women with genetic risk factors now have a way to monitor their breast health without constantly worrying or having a radical double mastectomy, which only lowers your risk (as described in this book). Finally a book that gives current information on all forms of estrogen (bio-idential, flax, soy, etc.)! Thank you to both Dr. Hobbins and Wendy for this visual description of what's going on in our breasts. This book is bound to be controversial, but as the book states...the thermographic pictures don't lie. This truly is a revolutionary finding!" "Dr. Hobbins scanned 100,000 women's breast for cancer during his career using thermography. His thermography images are excellent and far superior to any I have seen. I was surprised to learn that only 7 thermography centers in the USA scan and report correctly and that thermography results are utilized to assist women in lifestyle changes to prevent cancer. The outlook for breast cancer is bleak (it comes back in other body parts sooner or later). Mastectomies do NOT insure breast cancer will not reoccur.His knowledge regarding hormones and erroneous treatment is excellent. Soy and flax are touted as great health foods,but contain an outrageous amount of estrogen. Small dosages of estrogen are in our drinking water. Elevated estrogen imbalance leads to breast cancer. Progesterone creams are often made from yams. It is necessary to remove the estrogen from the yams so progesterone creams treat not cause breast cancer. What a wealth of information. Women and their physicians should read this book." A must read for any female!! "The book is lighthearted but very evidence-based, and provides important facts and figures about how estrogen and estrogen-related products can contribute to your breast health. Pictures are worth a thousand words and provide proof of exactly what changes can be caused by estrogen intake. If you want to know the truth, read this book and buy it for your friends and family. You won't be disappointed! Invaluable information every woman should know." "Put together in an easy to read yet highly informative manner, Breast Cancer Boot Camp reveals the truths about breast cancer, its link to estrogenic factors in woman's everyday life and how myths are seen as facts in the mainstream medical community. A must read for any woman of any age!" "I am Dr William B Hobbins MD and am writing my response to a non-identified verified published criticism who expressed their own point of view without revealing their personal background and qualifications. I personally, in five and a half years and as many as 14 reviews before publishing Breast Cancer Boot Camp, believe that I have experienced all that is in this book and even more since publishing this book. 87% of breast cancers need estrogen receptors to progress and, logically, estrogen to bring conclusion. It is not true that "somatic mutations" are occurring as the cause. No supporting data was suggested. The genetic testing of BRCA is most likely from birth; however such people need more observation to find breast cancer in its earlier stages. My Co-author, a licensed primary care physician of California, Wendy Sellens L.Ac. has spent seven years reviewing all of my literature since 1972 when I started the Wisconsin Breast Cancer Foundation, and as the co-author, she is not misquoting me. I consider her my protegee. Wendy was awarded and recognized for her work and studies in thermography as a 2014 woman of the Year by the National Association of Professional Woman for her writings. Wendy is also president of the Women's Academy of Breast Thermography and president of the non-profit The Pink Bow Breast Thermography research and education. I am a proud board member of both. She has the strictest standards for the use of thermography in the management of breast cancer which was promoted by me using both black vascular pattern and color separately for associated temperature changes; both must be done. She has established the Pink Bow as a Non-Profit organization to provide all woman care with reduced expenses to avoid this disaster, diagnosis of breast cancer. I was trained by Dr Ray Lawson of Montreal, founder of Medical Thermography. Prior to the use of thermography, I was performing mammography (since 1962) and was awarded the largest study in Wisconsin to discover non-palpable cancer by mammography and joined American Academy of Thermology (AAT) and then, I was awarded (October of 2012) the first, and only, so far as I know, the AAT Lifetime Achievement Award by this society. I have used Thermography as the primary screening pattern since 1972. If there is a specific disagreement I would be happy to review this opposing point of view for resolution. I remain convinced that removal of estrogen in it's over prescribing and the use of additional imaging is necessary assuming a mammogram has been performed. The gold standard in difficult cases is the use of MRI with contrast of gadolinium. The state of Wisconsin has the highest estrogen levels in its domestic water supply as do the rest of the states have elevations as well, which is a concern of mine as it is potentially effecting the general public. Thermography can be performed initially for screening, looking for the disease onset, and this book is essential to show the signs and their significance." Comment was posted by co-author Wendy Sellens with Dr. Hobbins's permission since he does not make purchases at Amazon. To verify please read his introduction to "Breast Cancer Boot Camp" in Amazon's free preview. "This book, indeed the entire premise of this book is a digression from the scientific development of thermal imaging for breast cancer detection. Estrogen isn't the cause of breast cancer; acquired somatic mutations are. Estrogen in various forms can promote the growth of most breast cancers and supplementing estrogen is probably over-prescribed. That said, associating all vascular patterns on the breasts with risk for breast cancer is seriously misguided and belies the potential benefit of real breast cancer detection through a scientific application of infrared imaging. I bought this book as it listed my old friend Dr. Bill Hobbins as a coauthor but I couldn't find anything but some misquotes. I doubt that he would agree with much of its content. In short, this book represents much of what is wrong with breast thermography today in the hands of self professed and pseudo-experts."